In alignment with his overall approach to addressing business conflicts of interest, President Trump has signed over the lease to his Washington, D.C., luxury hotel to his eldest son Donald Trump Jr., according to papers filed with the District of Columbia government obtained by the public radio station WAMU. 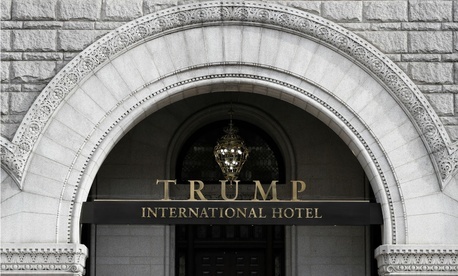 The papers, dated Feb. 3, list the son as president of the company that operates the hotel that opened in September in the federally-owned Old Post Office Pavilion just blocks from the White House, reporter Patrick Madden said. The General Services Administration has been struggling to determine whether Trump’s assumption of the presidency—unforeseen when the lease was signed in 2013—is allowed under federal contracting law. The lease states that it prohibits “any elected official” from benefiting from the company’s lease arrangement. A frequent critic of Trump’s arrangement, former Obama White House counsel Norm Eisen tweeted on Monday night that the president “has resigned from mgmt.. only, but still holds ownership interest,” which would continue to violate, in Eisen’s view, the lease and the Constitution’s emoluments clause. The nonprofit advocacy group that Eisen co-chairs, Citizens for Responsibility and Ethics in Washington, said in a statement to Government Executive, "This changes nothing. The issue is his ownership, not his management. As long as he maintains ownership, he maintains his legal issues." Steven Schooner, a professor of procurement law at The George Washington University who has been critical of Trump’s arrangement for months, agreed. “The lease requires career GSA civil servants—who report to the GSA administrator and who will serve at Trump’s pleasure—to decide whether to ask the president’s sons for more detailed revenue and expense information, demand an audit, or call for a rent increase,” he told Government Executive on Tuesday.